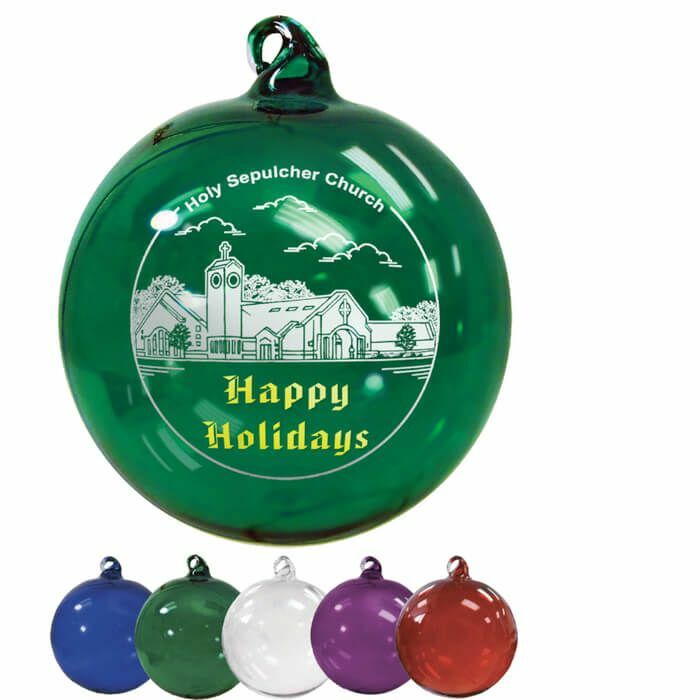 Hand blown glass ornaments are available in five elegant colors. Each ornament is individually packaged in a protective gift box - see third thumbnail picture above. Imprint Area 1 3/4" in Diameter, full color: 1.5" Diameter. These are beautiful. We can't wait to give them out as gifts to our members. We were looking for something that didn't look cheap and these are perfect. Our logo is perfectly centered when in the package. The only downside is when it hangs on the tree the logo is slightly crooked, but there is no way to fix that. We will use promotionchoice for any future orders on these or other products. We ordered these beautiful glass ornaments as gifts for a Women's Christmas event. Promotionchoice was VERY accommodating! They worked with us daily to get the graphic correct. Very nice and professional staff! I am so impressed with this company and this product! We "decided" last minute to do logo Christmas ornaments and we found promotionchoice.com to be accommodating and professional. The rush fee was expected yet fair and reasonable! The product exceeded my expectations with the quality and packaging! I can't wait until next year when I give us both enough time to make next year's ornaments even more detailed!! I already referred you to other business owners! Thank you thank you!! Will be ordering Ornaments from you again! Good morning, We got our ornaments this morning and they look great—thanks again and I'll be ordering from you all in the future. Merry Christmas! Hi, just wanted to thank you for the spectacular ornaments. The print on them was awesome and thank you especially for getting them to us on time for annual party. Your customer service was phenomenal! Highly recommend and completely trustworthy - when they tell you they can deliver on a certain date, they mean it and deliver it! Thank you again and Happy Holidays!